For almost three weeks, my family and I made a trek to Thailand, Vietnam, and Cambodia. One of the most poignant places we visited was the Tuol Sleng Genoicide Museum in Phnom Penh, Cambodia. It is a visit that must be seen to confront the past, and I applaud that the Ministry of Culture and Fine Arts of the Kingdom of Cambodia has opened the prison to show the unspeakable acts that happened there. The entire time I was in the prison, I reflected on the nature of governments and political leaders as they enact laws. I cannot imagine being at the whim of despotic leaders where you are stripped of all dignity and human rights. The prison was a memorial, and hopefully a vow, to stop genocide in this world. 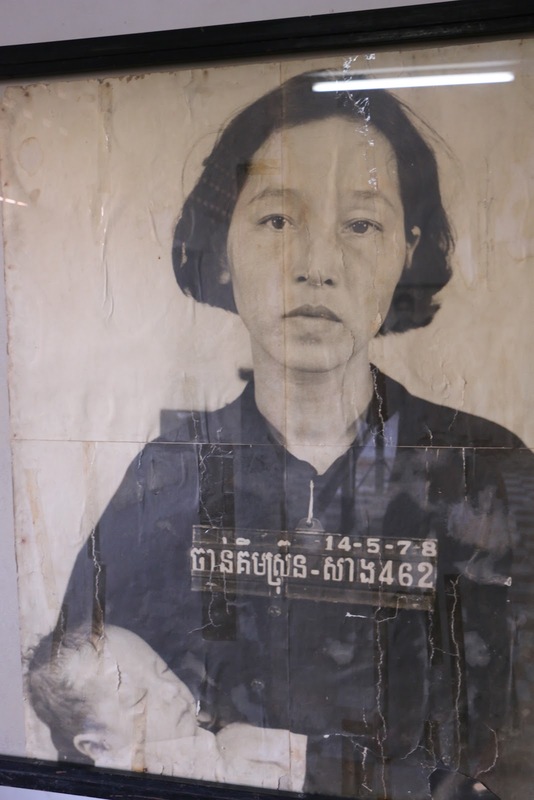 To look into the Cambodian faces who were some of the 17,000 prisoners at the Tuol Sleng Genocide Museum in Phnom Penh, Cambodia was a haunting experience for me. The prison, once an ordinary high school before the Khmer Rouge took it over in 1978, was a place I knew I had to visit--to understand the past of some of my beloved friends who fled Cambodia. I shuddered and cried as I looked into the fearful, helpless faces in the photographs. 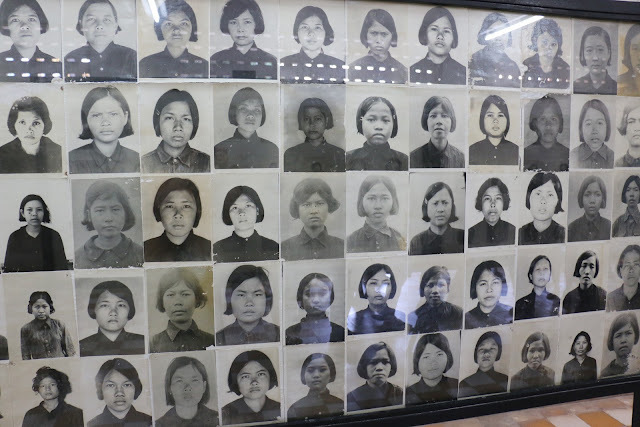 Many were young, looking like they were trying to be brave, as they faced barbaric torture from the Khmer Rouge. The Khmer Rouge soldiers wanted the victims to confess any assortment of rules they had allegedly disobeyed. Pol Pot commanded everyone who was educated or of any minority race to be eliminated. All people who were Chinese, Vietnamese, or Muslim were tortured and killed--sometimes ordering their families to do it. Two million people were killed during his reign of horror and terror, about one fourth of the population of Cambodia at the time. A picture that holds a thousand words of a mother and child in the prison. Cambodians fleeing Phnom Pehn on April 17, 1975. They left their homes--emptying the capitol. The Khmer Rouge soldiers told them they would be in the country for a short time, lying to them. If they were tainted with the sin of being a "city" person, educated, had any presumed connection to the government, or were from another race, they were atrociously killed. I had the great pleasure of meeting Chom Mey, one of the twelve survivors (now only seven) of the Tuol Sleng Prison, out of 17,000 prisoners, in Phnom Penh, Cambodia. He survived because he was a mechanic, and knew how to fix anything for the Khmer Rouge. He fixed their typewriters, bikes, anything mechanical. He is 84 now, and has written a memoir of his life. I was thrilled, humbled to meet him. The prison (also called S-21) was the secret center of a network of nearly 200 prisons where people were tortured by the Khmer Rouge. He says he forgives all the Khmer Rouge soldiers because they were only pawns or victims in a tuggle war between some diabolical leaders. The proceeds of his book go to a organization that helps survivors of the Pol Pot genocide. I am old enough to remember the CBS anchor, Walter Cronkite, on the nightly news chronicling the Vietnam War in our living room. 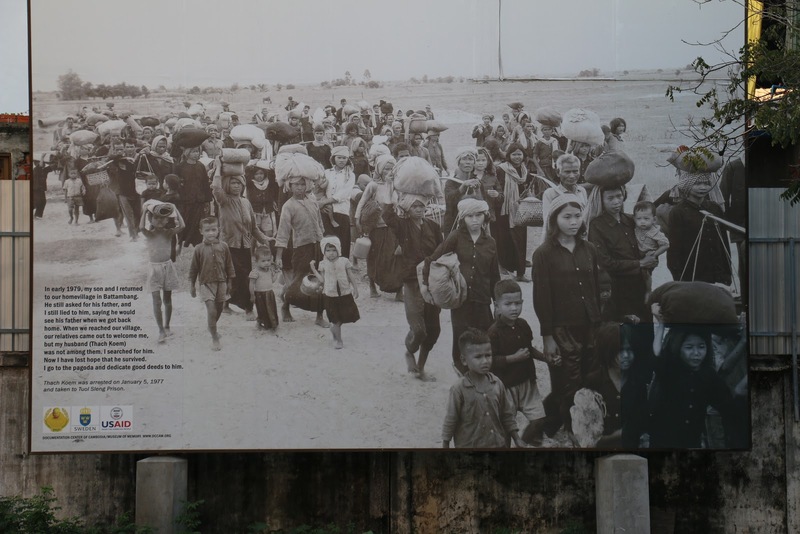 It was a war that collided with borders in Laos, Cambodia, Thailand, and Vietnam. Refugees fled to the Philippines, Thailand, Indonesia, Malaysia, and a refugee camp in Hong Kong. The despairing faces on the screen were foreign to me; Hanoi and Saigon were literally a half a world away in a place with marshy rice fields and an expansive river named the Mekong. As a young child, Pol Pot, the leader of the Khmer Rouge in Cambodia, who spearheaded a genocide of his own people, was only a sad tale to me that was happening on the other side of the world. A few years later, however, some of those same people, who struggled on boats and across fields punctured with land mines would be my friends--beloved friends. I worked in refugee camps in Thailand and the Philippines in the 1980's with Southeast Asian refugees from Cambodia, Vietnam, and Laos under the auspices of the United Nations. It was then that those displaced people became real people to me. No longer were they just tragic faces on a TV set. I taught them English, but also practical skills to hopefully assist and benefit them in their sponsored countries. We tried to have fun together, and help them forget their current circumstances with staged fashion shows, fairs, and mock job and bank interviews. There were large pavilions or sheds, with only a roof and a cement floor. Sometimes there would be 1000 students at one time, sitting on their mats, waiting for me to teach them with my translator. Women breast fed babies, and brought their children to listen too. Men, with anxious faces, tried to grasp a new language and imagine the country they were taking their family to. I taught Buddhist monks who invited me to their self-made temples in the refugee camp. Older people, who had never held a pencil in their hands, were my students too. Here is a picture of my Cambodian grandmother, Meek Chy. She is 81 in this picture, and I called her Jidon (meaning Grandma in Khmer). 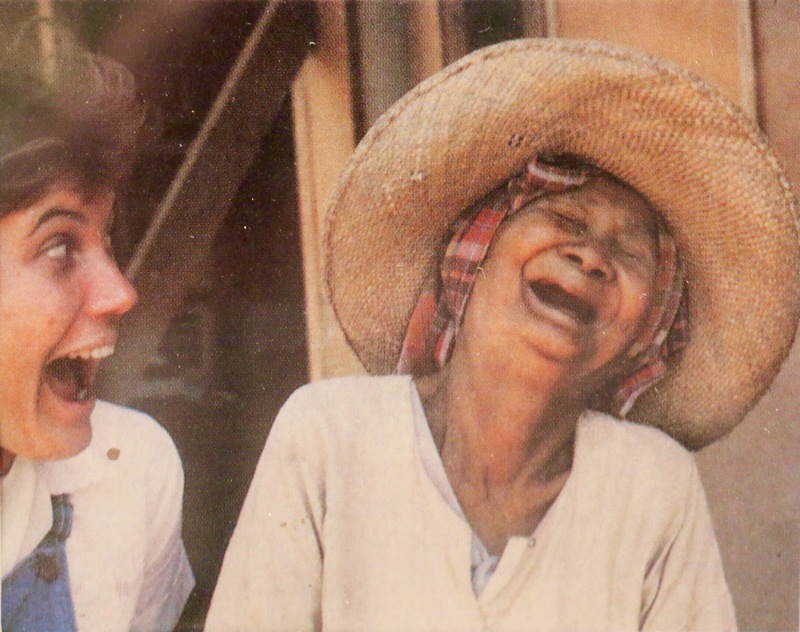 She was one of my dearest friends of my life, illiterate, but gifted with a sense of humor that could make a class of 1,000 Cambodian refugees roar with laughter. Every day she sat on a mat in the front row of the open-aired shed that was our classroom. She held a pencil in her hands, the first one she had ever held in her life. I still have her school work that I treasure where she wrote her name, some words, and numbers. She was bequeathed with a sense of wonder and intrigue about learning, and was captivated about the prospect of being a student for the first time--in a refugee camp, of all places. She acted like a small child who is proud of their first drawings or written letters--always running to find me to show me her work. This is my favorite picture because it shows how she could roar with laughter, and lighten the air for everyone around her. Everybody always wanted to hear her upbeat comments and jokes. She could have given Tina Fey a run for her money. 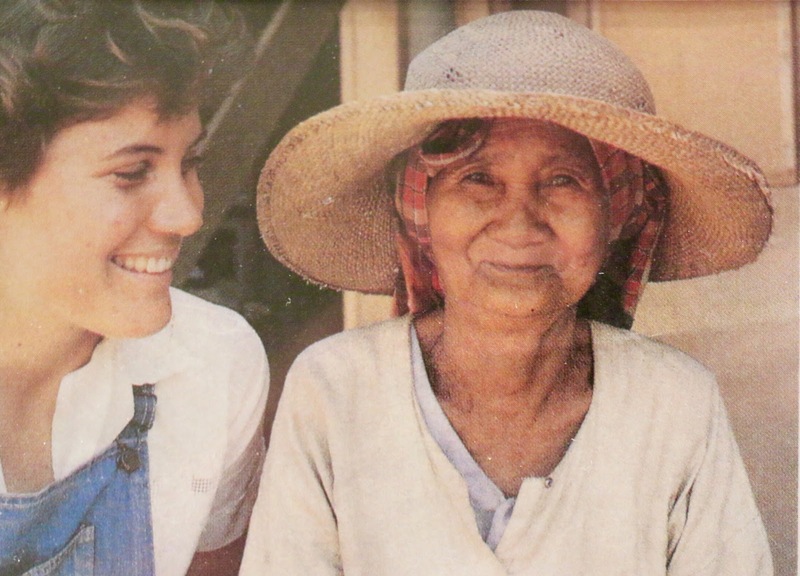 Her clever wit was a gift for all the Cambodian refugees. I was in Thailand with her, and then she followed me to the Philippines when I worked at a refugee camp in Bataan. I tried to look her up in Brooklyn, NY, when I got home, but I never saw her again. Her face, and especially her smile and laugh, always bring a flood of happy moments to me. 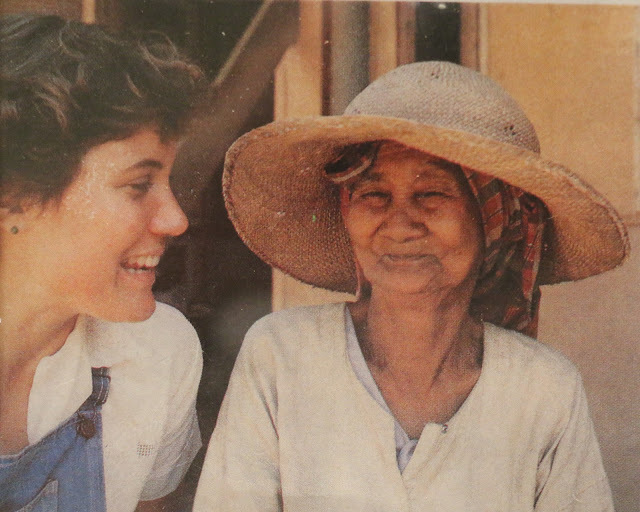 In over 30 years, I had never returned to Southeast Asia--although their stories and faces have never been too far from my heart. Some of them I tracked down in the US, curious to see how they were faring in their sponsored country. To go to Southeast Asia recently to see a Khmer Rouge prison, killing fields where Khmer Rouge slaughtered their own people, and to go on the open seas around Vietnam made me confront the hosts of faces that have never been too far away. However, I retained a folder of oral histories that were written by Lao, Cambodian, and Vietnamese refugees in the 1980's in a drawer all these years. As one refugee said, "It takes a river of ink to share our stories." Here is one story by Mr. Kour Chantha, a Cambodian who was a young man in his teens at the time of his escape from Cambodia to Thailand. His story reminded me of my 17 year old Cambodian translator who carried his grandmother on his back from Cambodia to Thailand--through the forests and mountains that were spotted with hidden land mines. "We slept, with the shelling of the Vietnamese troops began to explode again." "At once, we carried my mother into the dry ditch in which garbage at the bottom. We all kept lying in in it with fear until none of the rocket falling. Tomorrow morning we asked people there for uncookable rice, they very kind to our family. Some gave us a half of rice bucket, some others gave us a rice bucket. In order to make uncookable rice into cookable rice, we dug a small hole and spread a sack onto it, then we put it in and pounded it. It was very hard to make it into rice. But we must try to do it so that we had rice to cook." "After three days of rest in the Krapeau Har village, my family and some of the villagers were forced to move in another village called by Bay Domram. We stayed in it one day. Tomorrow morning we were all forced to cross the river to the bank side. While I walked across the river, the water reached my breast. So the small children didn't cross, my brothers, and brother-in-law and I took my nieces, nephew, and my mother to a bank side. And then we reached a village that I didn't know its name. We were staying there two days." The second night we had a plan to escape from the Khmer Rouge's control. At midnight some other Khmer family and my family walked along the Sangker River silently.We carried my mother on our back one by one until we reached in Battambang town. When I was living in the town. I had many trouble because of shelling of Khmer Rouge from the nearby section. Some people died and hurt every day. We were living in the town for three months and then we went to live in our native village. "My mother seriously sick from one day to another day. And then she passed away because of no doctors, no medicines to cure her." "On the day which she died, my brothers and sister sat around her. Sometimes, she called my second brother's name, sometimes, my sister's name. She called one after one and pulled our hand on her chest, and said, "My dear son. Let all of you love one another if I die." When we all heard her like that, our eyes filled with tears. We all said to her, "Mother, don't think so." "After a few time, she said, "I am thirsty, and give me a drink." She had a drink. When she closed her eyes, and she could said nothing. A few minutes later she died. We all were crying louder than before. I thought that from then on, I had no mother to call any more." Written by Kour Chantha, arriving in Thailand on November 28, 1979. The Buddhist burial is an immensely important rite. Sometimes funeral-goers can be at a funeral for several days to send off the loved one after they have died. Also, there is belief in Cambodian folklore that without a proper burial, the spirit will wander aimlessly. I hope that through the oral histories, the memorial museum, the killing fields that people are visiting, but mostly the faces, that the Cambodian people can find peace to its history. With the faces in my memories that I confronted on this trip, I hope those who survived can bury their loved ones in their minds--that they do not think they are wildly roaming the forests of Cambodia. God, give them peace. I am grateful that for a short time, at least, I was able to be in the presence of some of the most wonderful people I have ever known--in refugee camps. After I recently saw their killing fields and the places they had fled, the memories of our laughs and tears streamed together. Many faces and stories unravelled--reminders of their tutoring me on how to be human when others had forgotten how. Whether they knew it or not, they helped me grow up. I have never been the same since I first saw their faces. Wow, I can only imagine what an experience that must have been for you. I read "To Destroy You is No Loss" in college and it was one of the most depressing, yet eye-opening books I've ever read. Love the pictures of you with "Grandma." Thank you for sharing your tender and wonderful experiences with these beautiful children of our Heavenly Father. I enjoyed it immensely.